Demolish Your Competition With The Most Accurate, Safe & Innovative Nerf Foam Toy Bullets Now Available On Amazon! Presenting The Raytheon Toys Premium Nerf N-Strike Elite Foam Toy Bullets Mega-Pack! This exclusive Nerf pistol refill set contains 300 elite, safe and soft, blue and orange foam blasters, which will guarantee that you never run out of ammo again! Why settle for low-quality, made in China, foam darts that break easily and ruin all the fun, when you can have the most durable and heavy-duty Nerf shotgun bullets? Rest assured that our awesome Nerf foam bullet are compatible with almost every Nerf gun you might have, due to their ideal dimensions (7.2 X 1.3cm)! 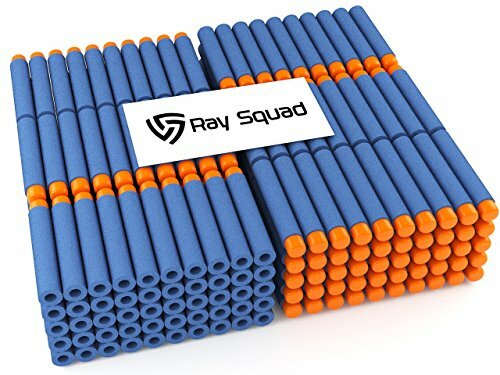 In addition, their innovative foam darts are utilizing the advanced Ray Squad Technology that ensures maximum precision and sniper-like accuracy, by adding extra weight to the plastic tip! Your children or friends will surely appreciate this extreme mega-pack of foam toy darts, since they can choose from various different darts, and colors we also sell red, green, orange, waffle, and glow in the dark darts! We confidently back our exclusive 300-piece Nerf dart set with an ironclad, full refund guarantee! Don?t Hesitate! Indulge Yourself! Dominate The Battlefield Now! Not compatible with the Modulus ESC 10. NEVER RUN OUT OF AMMO AGAIN! -- Now you can finally dominate the battlefield with Ray Squad premium nerf gun foam toy bullets! This incredible mega pack that contains 300 high-quality foam bullets! At Ray Squad, we provide more different dart tips and colors such as green, red, orange, and glow in the dark! We will make sure that you never run out of ammunition again! SHOOT WITH UNPARALLELED PRECISION & ACCURACY! - We have implemented the advanced, patented Raytheon TechTM technology to our elite foam bullets, adding more weight to the orange tip, thus providing you with extreme accuracy and maximum precision! ENJOY SAFE & FUN BATTLES WITH YOUR FAMILY! - The Raytheon Toys tested and approved Nerf foam bullets are ideal for endless hours of battles due to their safe and innovative design! Feel the adrenaline rush while battling with your friends or children and enjoy the slam fire action! SMASHING NERF FUN OR YOUR MONEY BACK! - We, believe that you and your children, deserve the most durable, accurate and fun Nerf shotgun foam bullets! That's why we proudly back our premium product with a hassle-free 100% money back guarantee! Enjoy the best simulated combat experience 100% risk-free! If you have any questions about this product by RAY SQUAD, contact us by completing and submitting the form below. If you are looking for a specif part number, please include it with your message.